Fuzzy Logic Cookers: Is Fuzzy Logic Worth It? Rice cookers have become quite common in households, but when it comes to best rice cooker there are quite a few things to consider before buying one. While precision cooking and quality of cooked rice has been the number 1 concern, cooks and chefs tend to look for ease-of-use and durability of the utensil as well. To add to that, modern-day rice cookers always have something to amaze you. For example, some top rated rice cookers can differentiate between white rice and brown rice, and they cook them at different temperatures. Then you have options to cook your rice according to your likings. Well, there are quite a lot of features to discuss. So, we suggest you read further and take a look at some of the best rice cookers 2018 we found out for you. Rice cookers aren’t just the tools for preparing your rice. They have advanced and have taken a lot more responsibilities than you can imagine. From basic to most advanced models, rice cookers can be categorized into 5 major types. Basic rice cooker models have simple on/off switch. They don’t have fancy design and the best thing about them is, they switch of automatically when the rice are done. Basic rice cooker models are certainly the cheapest. If you can spend in excess of $40 to $70, you can choose top rated rice cookers with keep-warm feature. This feature gives you a liberty to keep any type of food warm for hours. Normally, they have steamer tray and nonstick pans. If you’re going for high-budget models in excess of $100, then there are lots of digital models in the market. Rice cookers with digital controls have transitional designs, and they can keep your food warm for up to 12-hours or so. There may be other features as well, depending upon the make and model. Fuzzy Logic Technology takes rice cooker into the new generation. It gives added advantage and increases its ability to prepare soup, brown rice, and allows you to prepare your rice according to your favorite texture. Rice cookers with fuzzy logic technology are high on demand these days, but they come expensive. Induction heating is the latest advancement in rice cookers. It literally liberates you from doing anything other than pouring a bowl of rice into your cooker. There is no need to measure the quantity of rice or water level. This technology makes your rice cooker smart enough to adapt to the given situation, and prepare the best rice. The manufacturer that makes the best rice cooker is Zojirushi. They have a long history of making exceptional products. 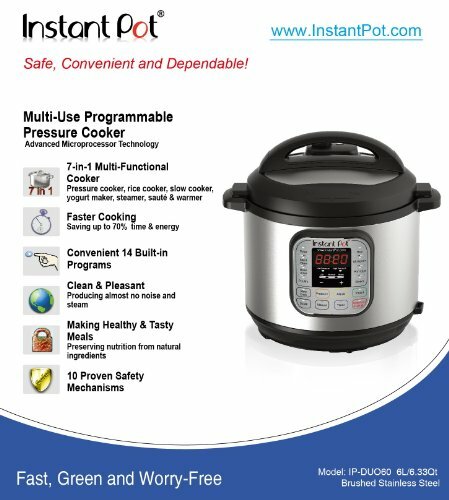 Another manufacturer that makes high-quality rice cookers is Instant Pot, they tend to make easy to use products that will help you enjoy delicious rice with little effort. 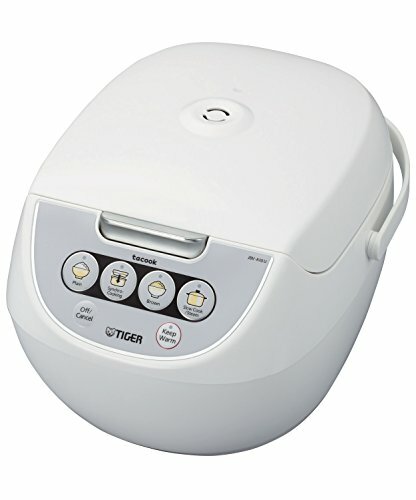 Tiger, Cuisinart, and VitaClay are also some top-rated rice cooker brands that will help you enjoy your rice rather than slave over your meals. Finally, Aroma rice cooker reviews note that these rice cookers are exceptionally well-suited to the modern kitchen, and you should be able to enjoy delicious rice with minimal effort. We are going to start off our rice cooker reviews with the Zojirushi NS-TSC10 5-1/2-Cup (Uncooked) Micom Rice Cooker and Warmer, 1.0-Liter. This rice cooker is, admittedly, on the higher end of the price spectrum. But if you happen to be generous when it comes to your budget, then this will be worth every extra dollar you will be spending. We’ve already mentioned Zojirushi being top rated rice cooker brand, and NS-TSC10 5.5 Cup Rice Cooker is an excellent example. If you look at performance and quality, there is no better option than Zojirushi NS-TSC10 5-1/2 Cup (Uncooked) Micom Rice Cooker and Warmer. If you can spend in the range of $150 to $200, this rice cooker model should be the easy pick for you. Let’s take a look at some noteworthy features of this product. Fuzzy logic technology has been a sensation in the cooking industry and the good news is, NS-TSC10 features this technology. The technology is smart enough to understand what to cook and how to cook without any instructions. It has built in functions to cook your rice according to your requirements. 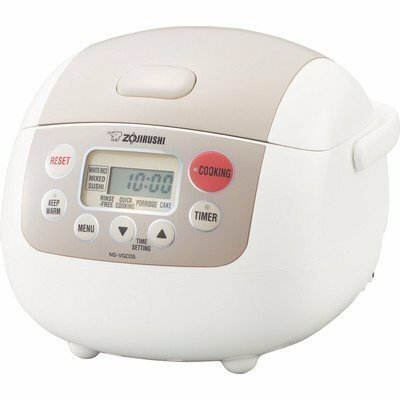 Zojirushi NS-TSC10 Micom Rice Cooker and Warmer offers LCD display. Then there are digital controls. The appliance is customer friendly and highly customizable, because you can program it according to your requirements. The reason why NS-TSC10 is among the best rice cooker models is, it offers more menu settings than any other electric rice cooker in the market. There are different options, including brown, cake, white/mixed sushi, steam, sweet, porridge and quick cooking etc. Now, let’s get down to the construction. NS-TSC10 features stainless steal exterior that is also easy to clean and clear. And don’t forget that automatic keep warm feature. If you’re concerned about space and capacity, this model is the perfect answer for you. NS-TSC10 5-1/2-cup Uncooked Rice Cooker offers 1-liter capacity that makes it stand out from the league as the best rice cooker. Considering the capacity, Zojirushi NS-TSC10 Micom Rice Cooker and Warmer has a dimension of 14 x 10.1 x 8.5 inches looks quite compact. 1-liter space is more than enough for 5.5 cups of uncooked rice. NS-TSC10 is quite spacious, serves up to 12 people at a time. The space allows you to prepare your meal for once. Then you can enjoy the leftovers of lunch at dinner, with same freshness. The rice cooker offers complete liberty to cooks, by featuring fuzzy logic technology. If you’re a working woman, you can put uncooked rice and leave for work. Your meal will be ready by the time you came back. 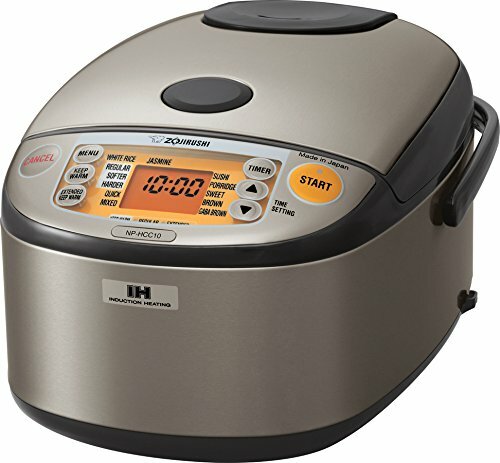 It offers 2 delay time settings unlike most rice cooker models in the market today. The cooking pot is made of aluminium with teflon coating. In comparison, there are other durable stainless steel models in the market. Then again, teflon coating makes it easy to clean and the rice cooker is tough to beat with all the features it has. Technically, you can serve 10 – 12 people on the dinner table at once. Modern-day features such as micom fuzzy logic technology, double steamer, 2 delay timer settings and reheating cycles make this appliance a must-have item for large families. 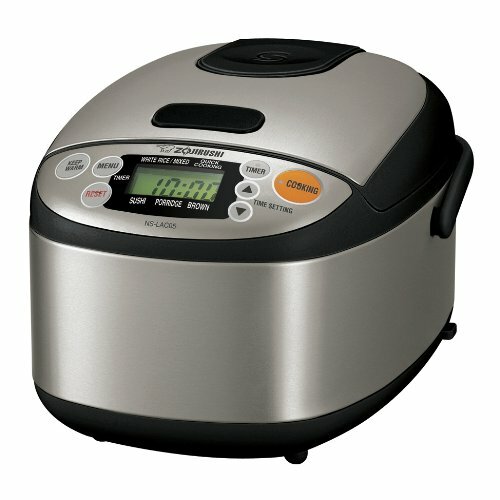 ​The next rice cooker in our list is from Zojirushi again. So basically you can expect almost the same features and capabilities. ove mentioned Zojirushi model offers, you can go for Zojirushi NS-LAC05XT 3-Cup Micom Rice Cooker and Warmer. The rice cooker offers multiple functionality, attractive design, durability, and more importantly, reasonable price. Here are some features of this model. Staring with the capacity, NS-LAC05XT rice cooker offers enough space to accommodate small families. It offers 3 full cups of cooked rice, which means, you can cook or keep warm rice for your kids. Handling will not be an issue for housewives, as this model has extremely light weight of 7 pounds. So, you can place it anywhere in the kitchen without anyone helping you. Since you’ll need rice cooker for day-to-day use, you must be concerned about sturdiness and durability. Zojirushi NS-LAC05XT has a strong stainless steel body, so even if it accidently falls, it can withstand that hit on the floor. The inner pot is washable and detachable. There are multiple menus to make think ultra safe and sophisticated for users. Micom Fuzzy Logic Technology is a big plus, and problem solver for those who haven’t prepared rice before. Apart from the built-in menu programs, you can also program this rice cooker according to your choice. With quick cooking option, you can take care of urgent cooking tasks. In short, preparing porridge, brown rice, mixed or white sushi won’t get any simpler than this. 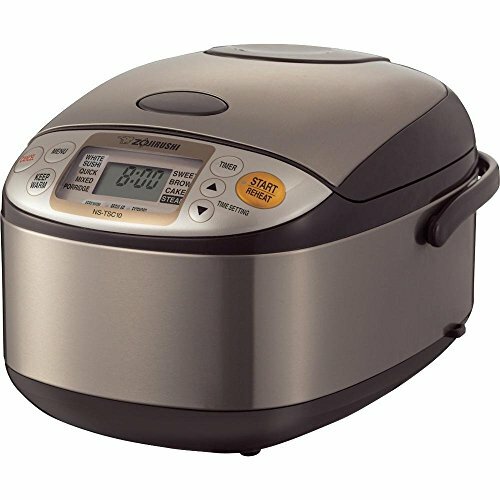 Performance wise, Zojirushi NS-LAC05XT Micom Rice Cooker operates at 120 volts. It features a powerful 610 motor for quick and easy cooking. In short, this modelis quite eficcient and cost effective for you. You’ll get many accessories with this rice cooker and warmer, such as steam tray, measuring cup, serving spatula etc. Plus, there is a recipe booklet as well as user manual to guide you through to rice cooking. Other features, such as LCD display and digital controls make things easier. Plus, this rice cooker will keep you updated with the status of rice as well as internal temperature. Finally, Zujirushi NS-LAC05XT Rice Cooker and Warmer offers one-year warranty to make your purchase secure. Apart from the basic factors, such as durability, portability and rice cooking, Zujirushi NS-LAC05XT Rice Cooker and Warmer has many things to amaze you. Fuzzy Logic Technology is still new to kitchen industry and is normally featured in expensive models. Considering that, you wouldn’t find a cheaper option with such a technology. Zojirushi NS-LAC05XT Rice Cooker is best for a family of 2 to 3 individuals. It can be your partner in the kitchen if you’re living away from your family, with a couple of office colleagues. There are cheaper and more spacious models out there. Having said that, none of them can offer similar flexibility and ease of cooking. It will be your best companion in the kitchen, especially when you don’t know how to cook rice. It will take you through the learning phase quite smoothly. If you’re living away from home and miss your mom’s rice, Zojirushi will make rice cooking quite easier for you. Starting with the design and construction, Zojirushi NS-ZCC10 Rice Cooker and Warmer is undoubtedly the most eye-catching model today. It looks quite stunning with its round and delicate shape, but don’t think it’s less sturdy than others. Talking about the technology, NS-ZCC10 has the latest of them all. It features Neuro Fuzzy technology that automatically sets the cooker to the right temperature of the rice. The rice cooker features multiple menu settings. You can white sushi, brown rice, mixed sushi, and even quick cook when you have less time. The rice cooker features LCD display, digital controls and programmable panel. Moreover, there is a One-delay timer setting for better convenience. It’s a limitation in one way, since we have seen some models with 2-delay timer settings. NS-ZCC10 has a spacious 1-liter pot that can consume 5.5 cups of rice. The dimensions of 14 x 8 x 10 inches prove how spacious it is. The utensil weighs around 8.5 pounds, which means, it’s manageable for most people. Zojirushi NS-ZCC10 is extremely powerful. It features a powerful motor that operates at 860 watts. In order to balance the power, the rice cooker features durable and sturdy stainless steel body. Moreover, you’ll get 1-year limited warranty along with the product. Other accessories include steam tray, two cups for measuring rice and serving spatula. User manual and a recipe booklet are also included with the package. Neuro fuzzy technology is the latest in the market and very few appliances have it. So, NS-ZCC10 is right there among 3rd generation appliances. There are as many as 8 functions and two delay settings. Plus it has automatic keep-warm function to preserve the taste and flavor of your cooked rice for hours. NS-ZCC10 has industry’s most powerful motor and considering these factors, price seems to be quite reasonable. The rice cooker offers a massive 5.5 cup capacity. That means, it can serve 11 adults at a time. Price of this model is slightly higher than other models in the market. But when you consider durability, performance and looks, you may want to stretch your budget a bit. If you want an appliance that takes care of everything and you just need to pour rice in it, you must buy NS-ZCC10 5.5 cup Neuro Fuzzy Rice Cooker for your kitchen. It is modern. It is massive and it has everything you want in the best rice cooker. If you think pressure cookers are not supposed to cook rice, you should take a look at this amazing product that can do more than what an ordinary rice cooker can. 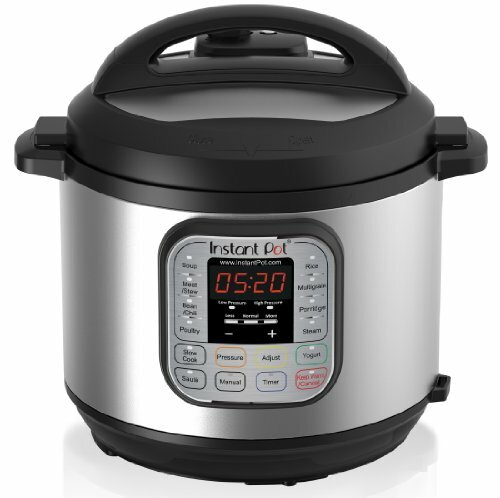 Instant Pot IP-DUO60 7-in-1 Programmable Pressure Cooker is simply amazing when it comes to cooking meals, especially rice, sushi and more. A best rice cooker should be able to not only cook rice, but to preserve taste and flavor for hours and that’s what this cooker can do. It can cook rice, keeps them warm automatically, works differently for different types of rice, and offers 3 temperature controls. Not to mention about the large 6 Quarts capacity, this 7-in-1 programmable pressure cooker offers rice cooking, slow cooking, browning, steaming, yogurt making and warming features. Does any other rice cooker have that versatility? The answer is “No”. You may be concerned about the safety and hygiene of the cooked rice. This digital appliance best answers your concerns. All of its 10 amazing safety features have been certified by UL and ULC, so there is no need to worry about the safety and hygiene. Instant Pot IP-DUO60 comprises of stainless steel cooking pot with 3-ply bottom, stainless steel rack and handle. The outer rim is coated with heat resistant paint, so that you can hold it without feeling the heat. The full size rated inner pot capacity allows you to cook all kinds of food for the entire family. Moreover, the cooker is energy efficient, takes far less time than ordinary rice cookers to cook your rice, thanks to its built-in functions. ​The large and sophisticated control panel has 14 built-in smart programs, including automatic keep-warm, dual pressure and 3 temperature controls for sauté cooking, making it compatible, stress-free and smart enough to take on any cooking challenge. Most talked about benefit of this multi-function pressure cooker has been energy-saving. It has proven track record of reducing energy requirements up to 70%. You’re not only getting a rice cooker, you’re getting a complete cookware to prepare any meal for the entire family. And that’s the best benefit of IP-DUO60. Normally, rice cookers work for one type of rice (mostly white rice), but this cooker works for white and brown rice equally well. For those who already have a pressure cooker, investing in another similar appliance may be a waste. But when it comes to flexibility and safe cooking, even ordinary pressure cookers can’t compete with it. ​The VitaClay VF7700-6 can definitely keep up with the other rice cookers in this list. This 6-cup rice cooker is programmable with a computerized clay heating technology. And no, the clay is not just in the name. It really does employ an all natural clay cooking pot! Said clay has been used for cooking for thousands of years. This is because that particular type of clay absorbs and retains heat superbly and that makes it ideal for making things for cooking. Basically the VitaClay VF7700-6 is a clever mash up of the past and the present advancements in technology. The VitaClay VF7700-6 also has a double-lid design. That design creates a micro-pressure. When all of that is put in to consideration, this rice cooker will end up almost 50 % more energy efficient compared to most rice cookers available in the market. As you know, we can’t just consider this the top rice cooker if it just cooks rice and nothing else, right? 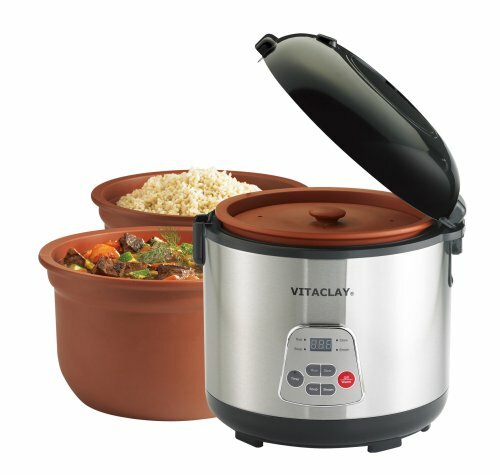 The VitaClay VF7700-6 will offer you a selection of 4 pre-programmed settings: rice, brown rice, stew, and soup. It can also be programmed to cook from 30 minutes up to 12 hours. The design of this unit is striking. With its floral theme, you’ll love the way this rice cooker looks on your countertop. The unit comes with several advanced features, and it’s right in the middle of the price range for those who want a more enjoyable flavor without the cost. There is a non-stick inner pan that allows you to easily clean the unit. It also features a retractable design, so that you can hide the cord and keep the unit sitting squarely on your kitchen counter, or take it with you and cook or reheat your rice at your destination. The top maintains a solid fit, and you won’t have to worry about spillover when you follow the recommended dosing for the unit. The product is made in Japan, which is the home of the original rice cooker. This rice cooker also comes with several presets to ensure that you’re getting the best quality rice. The presets use an intelligent control to ensure that your rice is cooked properly and with the right temperature. This may not be the ideal rice cooker for those who want to cook a variety of dishes. It tends to cook rice extremely well, but it can be difficult to cook other dishes. 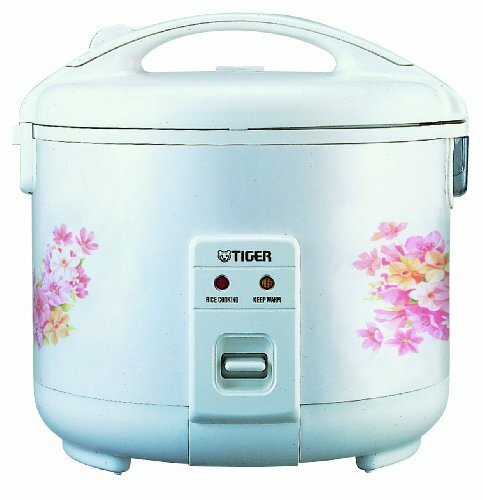 This rice cooker has a flower design, which should appeal to those who want an attractive unit. The keep-warm function enables you to keep the food warm for up to 12 hours without burning. The steam vent is removable and washable to ensure the unit stays clean. There is a retractable power cord to ensure that the unit stays in top working order and can be stored in a cabinet. A non-stick inner pan works well to prevent food from sticking to the sides of the pan. The rice cooker is finicky if you don’t use the supplied measuring cup to get the best results. The floral design might not appeal to everyone, and it is a very pronounced theme. If you don’t use the right proportion of rice to liquid, the liquid can easily boil over through the steam vent. This rice cooker uses induction heating, which heats the inner cooking pan eveny. This results in the ability to maintain precise temperatures to ensure that your rice comes out perfectly. The pan itself is heated using a system that incorporates magnets into the process. You’ll be able to prepare rice and other foods using high heat without burning your food. This rice cooker also enables you to make perfect sushi rice so you can experiment with hand rolling your own sushi creations. There is a multi-function menu that offers settings for a variety of foods. One special setting is the GABA brown rice setting. It uses a specific temperature of 104 degrees Fahrenheit for two hours to ensure that the nutrient content is kept in brown rice. This process of cooking increases the nutrient level of the rice by 1.5 times. There is also a Jasmine setting that enables you to cook Jasmine rice without worrying about pre-soaking. The unit will soak the rice for you and then automatically begin the cooking process. Induction heating uses a magnetic material that is placed in a magnetic field to heat the inner cooking pan. The rice cooker uses an easily readable LCD control panel. The clock and timer make it easy to program your cooker to prepare your meals at a specific time. Offers healthy cooking options, including brown rice, GABA brown rice and germinated brown rice. Stainless steel exterior makes it easy to keep this unit clean and looking brand new. The inner pan is not dishwasher safe since it has a non-stick coating. It’s important to select the right setting. For example, the Jasmine rice setting is 90 minutes because it pre-soaks the rice. But, if you already pre-soaked your rice, this setting won’t work. Rice must be carefully measured using the provided measuring cup to ensure your rice is cooked properly. Here is a rice cooker from one of the more known manufacturers of things that you need in the kitchen. If you do not think of Cuisinart when you are contemplating of buying appliances for your kitchen, then I do not know anymore. In our rice cooker reviews is the Cuisinart CRC-800 8-Cup Rice Cooker. The design of this rice cooker had me gushing. I know this is not the traditional cylindrical design, but trust me it has its great advantages. Top of the list of what makes the square design is the fact that it is very efficient when it comes to the space it will take up on your counter. Adding to the modern and chic feel is the fact that the exterior of the Cuisinart CRC-800 is made with brushed stainless steel. It will definitely blend in with your other modern gadgets if you are going for that effect. It even has a built in retractable power cord to achieve a clutter free space. 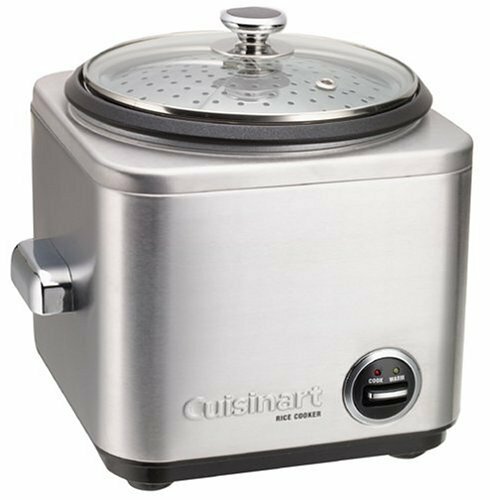 The Cuisinart CRC-800 can steam rice, meats and vegetables. It can make from 8 cups up to 15 cups of cooked rice. As expected of a great rice cooker, it senses when the food you are cooking is done and then automatically switches to keep war mode. That ensures that your food will stay warm for serving but avoids overcooking anything. The Micom 3-Cup Electric Rice Cooker is another product by Zojirushi, and it uses fuzzy logic technology to ensure a properly cooked batch of rice each time. The cooker holds three cups of uncooked rice, and it can produce up to six cups of cooked rice. It’s easy to use and read thanks to the LCD control panel that makes it possible to ensure you’re getting the best possible control over your food. The thick inner pan features a spherical shape to ensure that the rice cooks evenly. The rice cooker is easy to clean and maintain. 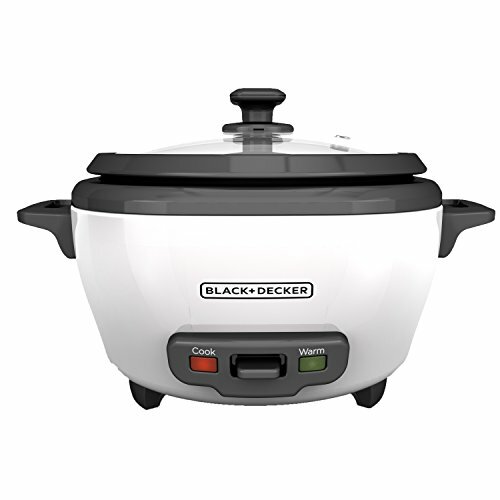 The detachable power cord makes it easier to store this rice cooker when it’s not in use. You can also travel fairly easily with the rice cooker to take your rice with you anywhere. While it’s not rated for outdoor use, provided you have a clean, flat and level surface, this rice cooker would work in an outdoor setting. The menu settings provide the optimal settings to make white rice, mixed rice, sushi rice, porridge, and cake. The rinse-free setting and quick cooking options are less commonly found options that will enable you to cook additional types of rice with little to no preparation. Unlike many rice cookers, you can cook as little as 1/2 cup of rice, which is perfect if you’re just making a single meal for yourself. 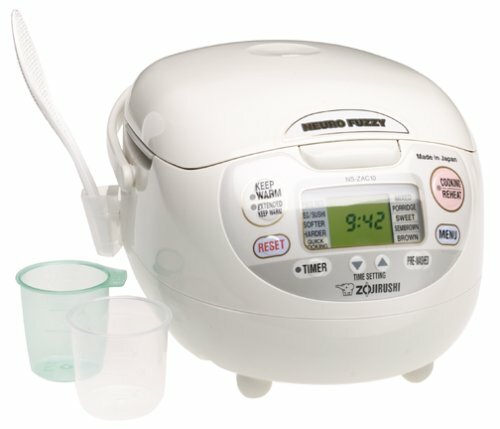 This is a rice cooker that is able to automatically respond to the current state of your rice. It adjusts the temperature and length of the cooking time to help you get the perfect rice each time. For its utility and performance, this is an exceptional rice cooker that will make quick work of even the most difficult to cook rice. Fuzzy logic technology offers one of the best technologies for cooking rice. The design of the inner pan is a spherical shape to ensure all of your rice is cooked evenly. An LCD control panel makes it easy to read the settings and configure the cooker in the manner that best suits your needs. Brown rice is made simply using the preconfigured brown rice setting that cooks the rice for a longer period of time. Ideal for smaller households that don’t need to make large amounts of rice for each meal. The rice cooker isn’t very large, which means you won’t be able to cook large batches. The automatic keep warm setting doesn’t have a lower setting to keep food warm for extended periods. Featuring a more egg-shaped design, some people might not like the unusual shape of the rice cooker. The cooking pan on this unit uses a BPA-free material to reduce the chance of toxins leaching into the food. It also features an innovative synchro option that makes it possible to cook a main dish along with your rice. The design prevents the flavors leaching off your main dish into the rice. This makes the cooking experience more enjoyable, and you’ll still get clean, plain rice when you’re finished. When it comes to settings, this rice cooker has four intelligent settings that allow you to choose the right cooking temperature and time for your rice. The rice cooker also has a keep warm setting that makes it possible to warm your rice to the proper temperature. The inner pot is made with a non-stick material that is designed to make it easy to clean and prevent food from sticking to the pot. A variety of accessories are included to help you get started cooking right away. The measuring cup provides an easy to use guide to select the proper proportions of rice to ensure that your rice comes out properly each time. You’ll also enjoy the one-button operation that simplifies the process of cooking your food. Affordable and small, this rice cooker offers a good value. Designed to make it possible to start cooking with one-button functionality. There are four menu settings to make it possible to customize your rice. The Synchrony-cooking function offers a unique cooking method that enables you to cook advanced dishes by cooking both the main dish and the rice at the same time. Comes with several accessories to help you get cooking on the very first day. Small design won’t allow you to cook large portions if you have company coming over or a large family. No timer or clock for pre-programming cooking preferences. Options are limited to plain, synchro, brown, slow cook and warm options. Aroma Simply is an attractive, affordable and sophisticated product line that features 3 sizes; 6-cup, 14-cup and 20-cup rice cookers. Our point of discussion is this 6-cup (cooked) rice cooker that looks quite traditional, yet offers some modern features. First of all, this rice cooker is suitable for both types of rice, white rice and brown rice. That’s definitely an edge over other models, since most models can only cook white rice. You can cook 3 cups of white rice (uncooked) and 2 cups of brown rice in Aroma Simply Stainless Rice Cooker. So, whether you’re preparing Chinese rice or spicy Biryani, you can depend on Aroma Simply Rice Cooker for best results. Another thing that makes this rice cooker stand out is its cooking pot’s material. 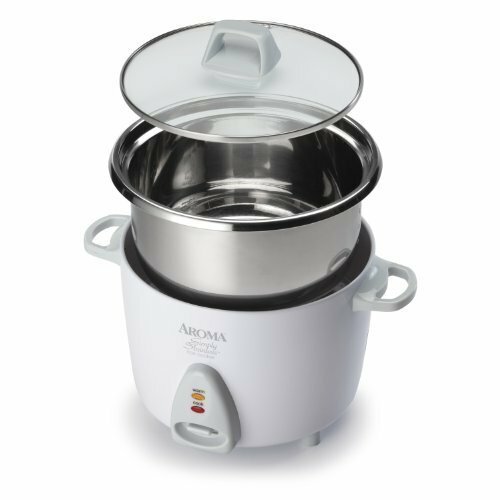 Unlike ordinary rice cooker models, Aroma Simply features surgical grade cooking pot made of stainless steel, that can withstand extremely high temperature. Surgical grade 304 stainless steel is also best for safe and hygienic cooking. It also preserves taste and flavor better than ordinary cookers. So, if you’re preparing meal for your kids, this rice cooker should be in your kitchen. ​With its traditional design and amazingly simple one-touch feature, Aroma Simply ARC-750SG turns out to be a must-have kitchen ware for all households. Imagine, how does it feel to steam, cook with just a touch? Plus, it offers automatic keep-warm option to preserve nutritious value of your rice for hours. If you’re concerned about performance, you wouldn’t get a better rice cooker than Aroma Simply 6-Cup (Cooked) Rice Cooker. It operates at 120 volt and it has a high powered 980-watt motor that helps you cook your rice in a jiffy. ​From the image you can see the removable cooking pot, but what you don’t see is its 100% surgical grade stainless steel that preserves taste and flavor better than other containers. Moreover, the loss of heat is negligible thanks to the transparent glass lid. Finally, Aroma Housewares offers limited warranty on this product. Aroma Simply offers a range of rice cookers made of surgical grade 304 stainless steel, which is far better than ordinary materials. It offers safe and healthy rice for the entire family. Performance wise, there is hardly any competition with this rice cooker. Rice cookers within this price range don’t often feature a 980-watt motor, but it has been made possible by Aroma Simply ARC-750SG. The rice cooker works equally well on white rice and brown rice. That means you don’t need to switch to stovetop cooking to prepare brown rice or decorated rice. Light weight of just over 4 pounds is another positive. It makes handling quite easy for cooks. ARC-750SG offers limited control. It is not as flexible as other expensive counterparts in the market. Still, it’s just perfect for preparing delicious rice. The cooking pot isn’t nonstick so it will take a little more time while cleaning. 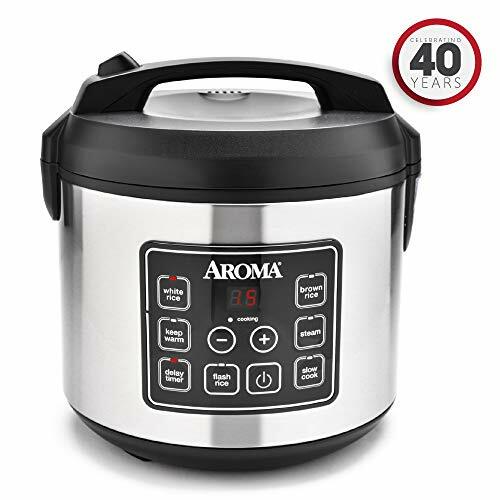 Aroma ARC-914SBD 8-Cup Digital Rice Cooker and Food Steamer is one remarkable addition to the manufacturer’s product line, offering some really exciting features for young and old cooks. Capacity wise, the rice cooker offers a massive space for 8 cups of cooked rice. Price is another factor to go for this utensil. In fact, if you see other similar products of different brands, you’ll realize that this rice cooker is cheaper than most. And don’t forget that you’re getting one-year warranty with it. Here are some noteworthy features of this product. Aroma ARC-914SBD Digital Rice Cooker is quite spacious, has dimensions of 8.5 inch by 9.3 inch by 8.7 inch. That’s enough to accommodate 8 cups of cooked rice. It’s fair to say that you can cook rice for the entire family in one go. As far as weight and portability is concerned, this rice cooker is lighter than many other models. It weighs just 4.2 pounds, so it’s quite manageable and portable. You can easily program this rice cooker for steaming, cooking white rice and browning using digital controls. The rice cooker features an automatic keep-warm function and can be a good storage container for your rice. You can set the delay timer and keep your food warm up to 15 hours. In short, if you have a tight schedule, you can opt to cook rice in the morning and serve it fresh on dinner. 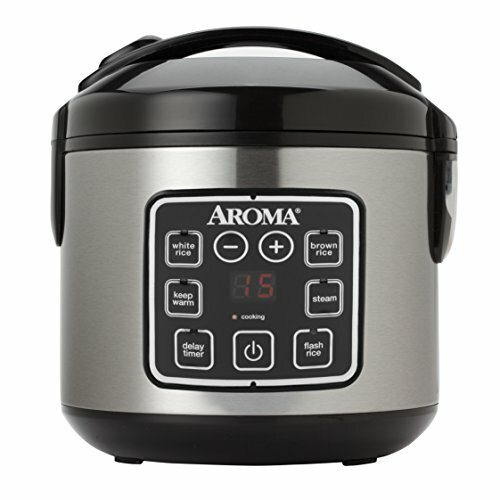 Aroma ARC-914SBD rice cooker has a massive space, which is a huge plus. It can serve up to 8 people in one go, while other models with same price range can prepare up to 6 cups of rice. The range of delay times is quite impressive, up to 15 hours. Normally, you don’t get to see such a lengthy delay time. Weight of the rice cooker is just over 4 pounds. So, it is a portable appliance. One downside is, it doesn’t offer slow cook feature and lacks STS (Saute-then-Simmer) technology too. Although, the rice cooker is quick, it still takes more time than pressure cookers to cook rice. Most of customers appreciated the appliance for the reduced cooking time. The rice cooker is known to cut down your cooking time up to 50%. Overall, ARC-914SBD is a great model for homes. Aroma produces some of the world’s best rice cookers, and it’s the number one selling brand in the United States. The capacity of this rice cooker is a whopping 20 cups of rice. It’s simple and effective design makes it possible to customize your rice cooking while still maintaining an easy to use and intuitive interface. Large buttons make it easy to adjust your settings, and the exterior of the unit gets warm but doesn’t get too hot. The unit is capable of setting itself to come on up to 15 hours later. This is great for those who want to have food ready when they come home, but don’t want to spend a lot of time preparing meals. Coming home to a fresh bowl of rice and some vegetables offers an excellent way to start your night. The unit also offers a completely stainless steel design, which makes it easy to put the unit in the dishwasher. Massive rice cooker is capable of producing 20 cups of cooked rice. The company offers a keep warm setting that actually works to keep your rice warm. Programmable options make this suitable for those who want to prepare meals in advance. The unit offers more than one function to cook the perfect rice every time. Comes with a steam tray and useful accessories to cook your food more effectively. The unit may be larger than most people need. It’s a bit heavy, but that’s to be expected with stainless steel. Due to the units size, this isn’t a cooker you’ll probably want to take with you or move to a cabinet when it’s not in use. As one of the more affordable rice cookers on the market, this one doesn’t offer many features. However, if you just want to cook a batch of rice, this unit will do that for you. With this unit, it’s extremely important to use the right amount of rice in proportion to water. Otherwise, your rice may end up overcooked. The unit uses a simple one-button design, and you’ll be able to enjoy fresh, delicious rice with minimal effort using this rice cooker. The unit has a stylish look, and it comes in three possible color options. It’s affordable, and it will provide a good option for people who don’t cook rice often. Steaming vegetables is a breeze with the included steam tray, and you’ll love the ability to create healthy and nutritious meals. All of the parts are dishwasher safe, which makes this an easy unit to clean up. The rice cooker doesn’t have any advanced features. Depending on the type of rice, you may have to experiment with the proportions of rice and water. While you can cook other foods in this cooker as well, you’ll have to watch them to prevent overcooking. The unit cooks up to six cups of rice, but cooking any less produces less desirable results. This is one of the top rice cookers you can get on the low-end spectrum. It simply cooks rice, which may be ideal for those who want a rice cooker that is devoted to cooking just rice. It has all of the features you need, including an automatic keep warm button that warms your food once it’s completed cooking. It also includes a nonstick pot to make cleanup easier. The food steaming basket is a nice plus, especially since many of the higher priced brands will make you purchase a steam basket separately. This is a good unit if you are willing to accept the presets and follow the directions exactly for cooking rice. One thing this unit doesn’t do as well is cooking brown rice. Brown rice requires a longer cook time, and that’s not possible to automate with this unit. Refreshingly simple one-button cook design. The unit bears a strong resemblence to a crockpot, and will match well with most kitchens. Includes a steamer basket, serving scoop and ric measuring cup. Non-stick basket makes for an easy cleanup. There are no options to customize the rice cooking preferences. Unit doesn’t have any smart technology to control the temperature for the best results. For the best results, you need to make a full pot of rice. When it comes to the best rice cooker, people often hear the name fuzzy logic thrown around. Fuzzy logic isn’t a brand name, but a type of rice cooker. They use a computer chip to control the cooking time and temperature. This gives the rice a better overall consistency because the rice cooker is designed to make “decisions” based on how the rice is cooking. Many of the rice cooker reviews available will not that rice cookers that use fuzzy logic are the best rice cookers. Even the best small rice cooker can be improved with the addition of fuzzy logic circuitry. Most of the top-rated rice cookers will include fuzzy logic technology. If you care about your rice being cooked perfectly each time, then you’ll love the addition of fuzzy logic. It makes the entire process of cooking rice much simpler. Even the best rice cooker isn’t perfect all of the time. Since rice cookers are so commonly used unattended, there are various safety mechanisms in place to ensure the device is safe to use. Each rice cooker is different, so it’s important you read the owner’s manual. Some basic safety precautions include learning where the hot surfaces of the product are and avoiding contact with those surfaces during and after operation. You should also always place your rice cooker on a stable and even surface. The now rice cooker reviews compared to the previous models are better, more flexible, and convenient. The conception of using the rice cooker to cook rice is too old. In fact, you can always utilize it one more recipe. It can say that the housework is never simple like that. Certainly, the most household should own at least one. Cooking of the housewives will become more gentle and easier. The family will get a delicious meal. Those busy who will be able to limit eating outside. What a great the best rice cooker. Always check online for availability of the rice cooker you wanted to buy. There are plenty of online shopping stores, but we recommend Amazon.com for safe and trouble-free shopping. Don’t forget to go through customer reviews below the product details, as customers who have used the utensil can best describe its pros and cons. If you have no time to go through specs and customer reviews, go through expert’s reviews, just like this one, in which different models have been compared and their strengths and weaknesses have been highlighted properly, to help you make the best decision. Always verify price and warranty at manufacturer’s website. Conditions for warranty may change with time. Moreover, see that that item is refundable, or if it’s broken parts can be replaced. After removing your concerns, click on the Purchase button.